The ADS-B “Mandate” approaches: January 1, 2020! While the mandate is for an ADS-B “Out” certified “Beacon,” it is obvious that the real benefits of ADS-B to the average pilot (both VFR and Light IFR) will be found in the FAA’s broadcast of TIS-B Traffic and FIS-B Weather, all free to the consumer. Even more significant is the “direct,” aircraft-to-aircraft, real-time traffic information you will see when you equip with ADS-B Out and In. You will benefit from this if you have ADS-B Out and are also equipped with an ADS-B In device, either certified or a non-certified portable. We’ve covered ADS-B Out so let’s put all the focus in this article on “Gettin’ IN” to ADS-B. Read the full version of this story with pictures in our March 2019 issue. Once the system is fully equipped, the FAA’s ADS-B infrastructure of satellites and ground-based towers are all in place and fully implemented, and every aircraft flying in controlled airspace is equipped with ADS-B Out, pilots should benefit from improved separation and allow ATC to put more aircraft into the same airspace, more safely. We’re not talking about VFR, fun flying here, and we are not talking about just safety either. VFR pilots would rather avoid busy controlled airspace and don’t generally enjoy talking with air traffic controllers (ATC). A percentage of this group will avoid ADS-B altogether. See, while ADS-B is being sold as a safer way, it is also a more efficient way and it will improve the bottom line for those who use an aircraft as a “profit source.” That’s okay! If a general aviation aircraft owner can get there safer and more efficiently (thus saving time and gas! ), then it’s all good! Let’s take a closer look at the free benefits found in an ADS-B In device. Cessna Avionics Webinars: More than 2 hours of instruction, free to members, click here. Direct Traffic: With all the talk about TIS-B, a rebroadcast of traffic from an ADS-B, ground-based tower, we understate the role of ADS-B to show you, right now on your cockpit display, the other traffic in your area. That’s because two aircraft equipped with both ADS-B Out & In will see each other: their N-Number, their altitude and their groundspeed. Direction of flight will be obvious. This opens up the concept of self-separation, independent of an ATC. VFR pilots do it all the time, visually. I think we can assume that two pilots on an IFR flight plan will have the help of ATC with ADS-B as a back-up. So, in this situation we might be talking about a meeting between a VFR pilot and IFR pilot, in the same airspace, both equipped with ADS-B In, and Out. TIS-B Traffic: TIS Traffic is not new. In the early 2000s, the FAA made rebroadcasts of traffic information from 107 Mode S Radar sites across the country available to GA pilots. The Garmin GTX-330 (2002) and Bendix King KT-73 were both Mode S (not Mode S ES) transponders that allowed pilots to see traffic and display it on certified displays. There were no wireless options or anyway to display it on an iPAD like we see today. The FAA has already started to dismantle TIS-A (as it was known) by upgrading radar sites and in doing so, eliminating TIS-A in those areas. I was never a big fan of it. Coverage was limited compared to today’s ADS-B TIS-B and I was afraid that having TIS traffic sometimes and not at all other times would create a false sense of security. I felt the same way about those portable traffic scopes. With traffic, you want it all and you want it all the time! No need for concern, the coverage map for TIS-B traffic (and WX) covers almost all the U.S. and is expanding. TIS-B serves two purposes. You should first know that ADS-B is a two-frequency system in the U.S. Mode S transponders operate on 1090 MHz and UATs (Universal Access Transceivers) operate on 978 MHz. The rest of the world is on 1090. This is an attempt on the part of the FAA to control bandwidth. Initially the concept was to put commercial aircrafts or anyone flying above 18,000 feet on 1090 and the GA population on 978. It’s not working out that way. GA pilots who need to update their old Mode A/C transponders (are numerous) and they are choosing 1090 MHz. The issue with traffic (WX is always on 978 MHz), is that pilots on 1090 or 978 MHz or aircraft not equipped with ADS-B can’t see each other directly and so the FAA rebroadcasts this information using TIS-B. TIS-B provides the position and altitude of non-equipped traffic to aircraft with ADS-B receivers (on 1090 or 978 MHz) and provides position, altitude, groundspeed and identity of ADS-B equipped aircraft to those aircraft on the alternate frequency. Bottom line is, if you want to see all traffic “directly,” which I think you will agree is better than a rebroadcast (especially from the ground), buy an ADS-B In dual-frequency receiver and get direct traffic from both frequencies. The good news is that most of the lowest ADS-B portable receivers offer dual frequency! FIS-B: A lot of companies have made a lot of money selling pilots subscription weather in the cockpit, so not everyone is happy about ADS-B Free FIS-B WX. Frankly, if you’re serious about avoiding dangerous weather, you’re probably not going to be happy with FIS-B weather either. At this time, ADS-B WX cannot provide timely protection if you’re flying close to a thunderstorm cell. Frankly, it can pay for itself by keeping you from entering one TFR! How will you display it? Most legacy aircraft owners can’t justify big EFIS screens, an MFD or even the extra $4,000 for the larger displays in a GNS-530, GTN-750 or IFD540/550. A new 750 or 540 represents 1/3 the value of a $60,000 airplane. Plus, you have your outdated #2 navcom, ADS-B, and the next engine OHC to consider and address. If you have one of these big screens and you want to display ADS-B Traffic and WX on it, you can, but remember, clutter (especially in a busy IFR environment) is not your friend. If you feel you have enough real estate to display WX and Traffic on your “big screen”, you need certified ADS-B In. “All in One” Units like the Garmin GTX-345 and L3 NGT-9000 “Lynx” are hybrids. They are a Mode S ES transponder and a UAT all in one. The “In” portion is certified to display on a certified display like an MFD, EFIS or a large-format navigator. Now you understand why they are about $3,000 higher in price. Freeflight and L3 offer a UAT that provides ADS-B “certified” Out and In, (both on 978 MHz) that also plays on certified displays. Bottom line is … ADS-B In certified costs more! Here’s proof! Garmin’s first attempt (2012) at an “All in One” ADS-B solution was the GDL-88. The “88” is a UAT transmitting your ADS-B Out “Beacon” on 978 MHz combined with a certified dual-band receiver. The unit receives traffic on 1090 MHz and 978 MHz directly and TIS-B traffic rebroadcasts and FIS-B WX on 978 MHz. The GDL-88 with certified ADS-B In receiver is legal to be displayed on big screens. Like Freeflight, I think Garmin saw the larger market for GA aircraft owners in the UAT market. Frankly, pilots who jumped into ADS-B early bought this unit. Some told me they wish they had waited! Retail was about $4,800 with built-in WAAS in 2012. As you will see below, Garmin introduced the GDL-84 in 2014 without the “certified” receiver for display on tablet PC’s only for about $1,000 less. As ADS-B “matured” and ADS-B products with built-in WAAS expanded, so did the reality that displaying ADS-B Traffic and WX on a smart tablet was going to be the choice for legacy aircraft owners without the budget for big screens. The Apple iPad remains the dominant choice. 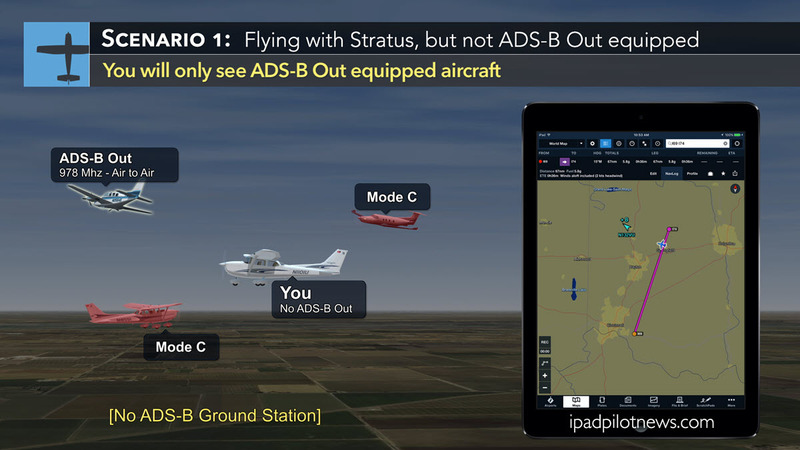 Companies like Foreflight in combination with the Appareo Stratus became the standard for those wanting the benefits of ADS-B In now. An ADS-B Out solution would come later. Appareo, recognizing this, did something that I see as “brilliant”! They designed a Mode S ES transponder with built in WAAS that “enhances” the performance of their already popular Stratus receivers and makes them both automatic and easier to use! If you have an iPad with Foreflight and a Stratus ADS-B receiver now or plan to add one and you have an old transponder, this is the only way to go in my opinion! The new, improved Stratus 3 is not the cheapest portable ADS-B receiver out there but when combined (and interfaced) with their Stratus ESG (with GPS @ $3,000) or ES Mode S ES (@ $2,500) transponder, it’s the best and safest use of a Mode S ES transponder with portable receiver. There are over a dozen portable ADS-B receivers currently on the market. All use antennas that are either internal or sticking up from the unit (some quite intrusive) and all attempting to receive an ADS-B signal within the confines of the cockpit. The fact is, if you try to operate a portable comm in that same environment with its attached “rubber ducky” antenna you will find that performance suffers. If you now attach that same comm to an external antenna, performance improves! So why wouldn’t a portable ADS-B receiver that you will depend on for direct and TIS-B traffic be more reliable and safer when interfaced to an external GPS and ADS-B (L-band) antenna? The interface between the Appareo ES/ESG transponder and the Stratus receiver does just that. You can probably add an external GPS and ADS-B antenna to most of the other portables but at what expense, $1,000? By the way, the other issue with portables is either keeping them charged or installing and running a wire from a USB charging port. The ES/ESG/Stratus 3 package eliminates this, keeps the unit always charged, and it comes on automatically when you activate your avionics master switch. Mounting a smart tablet somewhere in the cockpit can also be a challenge. While I’m talking up a company, Sporty’s “iPad News” is where you will find the answers. See the chart on Page 18 and visit their website (ipadpilotnews.com) for more articles about iPad software. While the list of available ADS-B Out solutions in not likely to grow this close to the deadline, we may see more portable ADS-B receiver options. If you plan to use a smart tablet, you’ll most likely be choosing a portable ADS-B unit. Take these things into consideration: How is it powered? Will you need to take it home with you and charge it if it has a rechargeable battery. If not, will you need to install a USB charging port and a wire from it to the unit? Are you okay with portable units sitting on top of the panel or suction mounted to a side window? If you are lucky to have a big screen navigator, EFIS or MFD, be sure to avoid clutter. Don’t even think of trying to put ADS-B Traffic and WX on a GNS-430, GTN-650 or IFD440! The screen is too small for this! Consider this discussion I had with an attendee at one of my forums at Oshkosh. He already had installed a GTN-650 and was using Foreflight and a Stratus 2 ADS-B receiver on his iPad. He headed to his local avionics shop with the intention of installing the Appareo Stratus ES. The shop talked him into a Garmin GTX-345 which would display on his GTN-650. He planned on keeping the iPad as a nav back-up anyway. When he flew to Oshkosh, he observed two things. First, his GTN-650 was so cluttered with traffic he could not see anything. And second, his Stratus 2 receiver on his iPad seemed to be missing some of the traffic (with its antenna inside the cockpit) that the 345 was seeing (with external antennas). The Appareo Stratus ES Transponder would have eliminated these issues and he would have had an extra $3,000 in his pocket. Make sure you’re armed with this information when you take your plane to the avionics shop. Until next time … Safe and Happy Flying!